Now that the car had emerged from The Works, the problem was where to put it. Our one-car garage is better at holding rain in than keeping it out, and it was now late winter here in the Northwest. There's no electricity in the structure (not any that I dare hook up, certainly) and I needed a place where I could start to put the car back together. That problem was solved painlessly. The second bay of Cameron's garage -- a nice, dry, adequately lit, carpeted and lockable garage -- was occupied by his PV444 project, which he'd intended to turn into a race car of some sort for years. It so happened that he was finally ready to proceed. 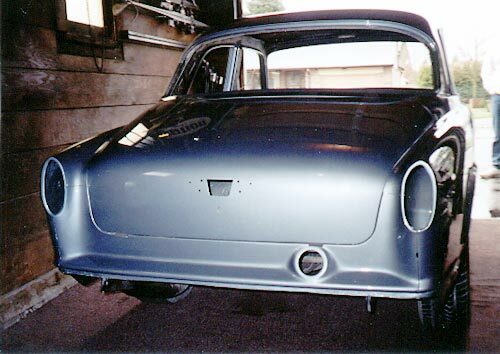 The first step was to send the car down to The Works for some bodywork and paint. Not the kind of bodywork and paint ours had received, but something that would be strong enough for rally use and look good at 100 MPH. The race car (not "the 444," not "the Peevee" or anything of that sort, just "the race car") went to The Works on the return trip of the truck that brought our Amazon back up. 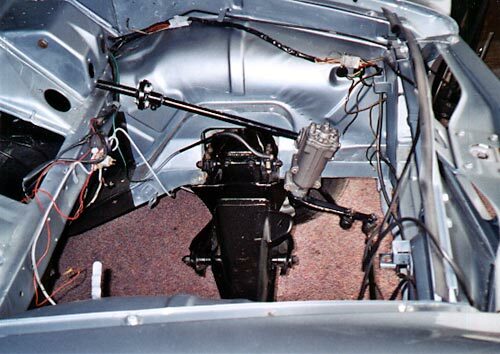 The first thing Bob did to the race car was cut all the floors out, so it looked like our Volvo's residence in Cam's garage was assured for some time. Cameron's garage makes a great halfway house. No parts have been put back on the car yet in this picture. In mid-March, I finished the last of my after-hours computer projects and finally had time to pay at least some attention to Volvos. I really didn't have any idea where to start on the Amazon. There was so much of it, and none of the parts to be put back on it were worth putting back on without being worked over first -- none of which had happened while I was spending the last seven months in a digital coal mine. It was actually Cameron who began the process by taking the wiring harness out of the car, scrubbing it clean, and putting it back in. Following his lead, my first action was to scrub the grime of the ages off the crossmember, and remove the steering gearbox and all the steering linkage for painting. While I was at it, I put some urethane bushings in the upper control arms. Bob didn't paint or clean anything we could do ourselves, so scrubbing and painting the crossmember, steering box and arms was the first order of business. Then Shayne showed up with a big box of used rubber grommets and plugs, and I set about scrubbing those and finding places to install them. After that, some of the wiring could be routed through the grommets. Doing that much took a whole Saturday. Reassembly would not be a quick process, it seemed. The rest of the parts were scattered around various locations. A lot of stuff was at Shayne's house, some of it was still at The Works, some was still on the old body parts in my basement. It was great good fortune that Shayne had built several 122s in the last few years and had a large stockpile of leftover bits he'd culled from junkyards. He also knew what went on inside doors and other places where I'd rarely ventured. I'd go through a pile of door latching mechanisms mixing and matching the best parts from each, then polishing them all with steel wool into presentable condition. Steel wool became the theme for weeks. It works miraculously well, but not miraculously fast. I've never been much for polishing, but I'd never worked on an immaculate, 100% rust-free, not one trace of Bondo anywhere, gleaming old Volvo before. There was no way I could bolt anything dull, worn or corroded onto it, even where it would never be seen again. The new urethane steering coupler is a part meant for a VW Beetle. It's a perfect replacement for the early-style Volvo coupler and should last forever. 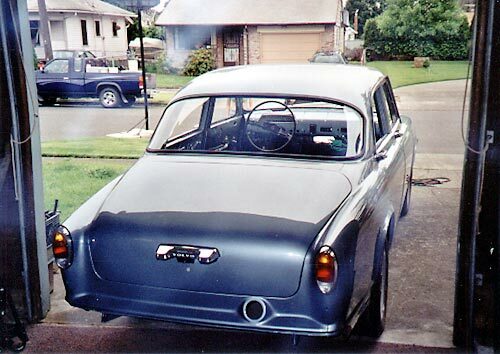 For a while, my evenings were spent polishing, fixing and painting parts in the Chamber of Horrors, and Saturdays were spent attaching them to the car. Progress many times came to a complete halt because some tiny bit couldn't be found right then, and that tiny bit had to go in before the stuff I'd spent the previous week's evenings prepping. Cam and Shayne were (and continue to be) a huge help, but they also have their own lives and obligations -- Cameron had actually embarked on remodeling his kitchen (not kidding!) -- and so I just worked in Cam's driveway on my own. It's far enough away that I could only get over there on weekends, so progress crawled. Lack of a single screw or speed nut could cancel a day's project and leave me standing around looking for aomething else that could be accomplished. 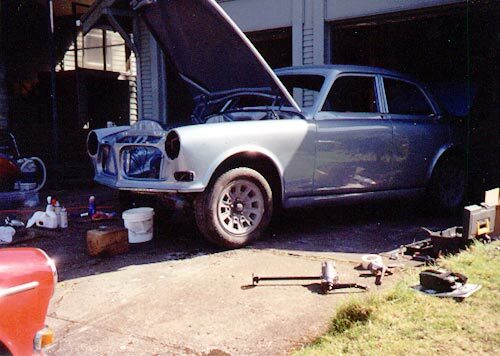 Restoring a car is an exercise in delayed gratification, I was finding out in spades. I wasn't at all excited about this whole affair. Over a pack or two of steel wool, I gave some thought as to why that might be. First the idea of saving the faithful old car that had been through so much with us seems almost inevitable. 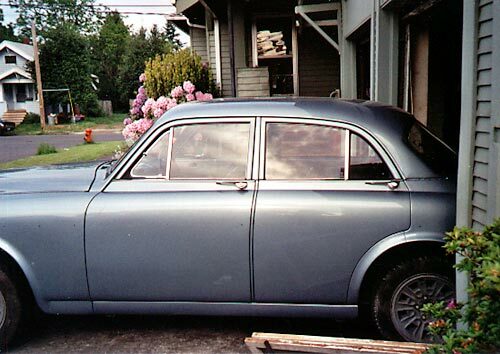 Then the car spends a year looking progressively more decrepit and less like our faithful old car. It becomes like an ancient, sick house pet that it would be a mercy to have put down. Fixing it doesn't seem quite so inevitable anymore. Then it costs you six month's salary and puts real strains on your home life. You cling to the notion that, once you finally see it, the sheer magnificence of the paint job will yank you around a mental corner and you'll view the universe in a new light -- and it doesn't happen. Bob's work does not lack magnificence in any way, but what sat in Cam's garage was not the faithful old car we loved for so long. It was nothing like it at all. It was a clean slate, anonymous and without personality. New window channel material came from J.C. Whitney. The front channel of the front doors and the rear channel of the rear doors is a smaller size. 140-series window channel rubber is perfect in those locations. I hadn't expected this reaction, although it makes sense after the fact. It took me a long time to start feeling some joy in the work, but I'm about there now. The thing is gradually looking less like sculpture and more like a car, for one thing, and an extremely nice car at that. It's important that many of the old parts are going back on, although imperfect. I'm getting them as good as I can get them, and that's actually the trick: I, myself, personally am finally participating in this restoration and its quality now depends on what I, myself, personally bring to it. I couldn't feel any ownership of the car if that were not so. Not that I'm about to turn away any help I can get -- far from it! I can finally imagine a time when the Volvo returns to daily service, although that won't be the day after tomorrow. Striving for perfection is often more satisfying than buying it. At this point, the Volvo needs be moved to our garage, and will be shortly. I'm much obliged to Cameron for the use of his place, but our own garage will do in the dry, and summer is only weeks away. 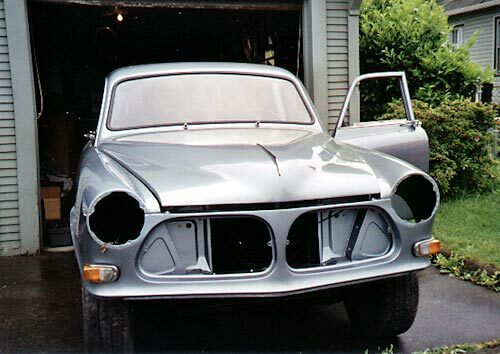 I'm running low on parts that need paint or polish -- evenings would be better spent working on the car itself. It is becoming our car again, and it needs to come live with us now. It's definitely looking like a car now, although much remains to be done. The color ranges anywhere from bright silver-gray to medium blue depending on the light. The old rear glass with the car's trademark Calvin sticker is in place. I'm diggin' it. Bob Moreno and The Works for incredible bodywork and paint. Tom Swartz for supplying several sections of new sheet metal. IPD for new turn signal buckets, hood, trunk, windshield and rear window seals (and for the springs, sway bars, shocks and urethane bushings that were on the car already). The Round Fender Register for a gorgeous new stainless hood trim piece, door seals, inner door panels and headliner. Lee Holman for sending used 140-series window channel rubber. Shayne Green for countless hours of work, two doors, one trunk lid, a fender, many, many smaller parts, and for his expertise in how it all fits together. Cameron Lovre for use of his garage and driveway, unflagging moral support, and for generally helping out in every way.